Place potatoes in 3-quart saucepan; add enough water to cover potatoes. Cover and heat to boiling; reduce heat to low. Cook covered 25 to 30 minutes or until potatoes are tender; drain. Let stand until cool enough to handle. Cut potatoes into cubes. Add potatoes, celery and onion; toss. Stir in eggs. Sprinkle with paprika. Cover and refrigerate at least 4 hours to blend flavors and chill. Store covered in refrigerator. Mayonnaise or salad dressing—what’s the difference? They are both thick, creamy dressings that contain vegetable oil, lemon juice or vinegar and seasonings. Mayonnaise also contains egg yolk and is less sweet than salad dressing. They can be used interchangeably so you can decide which you prefer. If you’d like a lighter dressing, sub in some thick, plain yogurt with a spoonful of Dijon mustard. There’s no creamy dressing on a vinegar-based potato salad like Dill Potato Salad. This type of salad is quite different from the one with a creamy base, but it is also served cold. Then, there’s Hot German Potato Salad which is also vinegar-based but served warm and has a bacon-flavored dressing. They are all delicious, whichever you choose. Heading to a picnic or potluck? Experiement with stir-ins to the basic recipe. Bacon, Ham, Pepperoni or Salami: Stir in 1/2 to 1 cup crumbled crisply-cooked crumbled bacon or diced ham, pepperoni or salami. Fresh Herbs: Stir in 1-2 tablespoons chopped fresh herbs such as basil, chives, dill, lemon balm or lemon verbena, parsley, oregano, tarragon, thyme, or lemon thyme (thyme is strong, so start with 1 tablespoon and add more if you’d like). If you’ve been asked to bring the potato salad to a get-together, this is the recipe you need. Not only does it feature all the classic flavors everyone loves, but it’s also easy to make ahead. The secret to making good potato salad is to choose the right type of potato. Waxy potatoes stand up better to being boiled, because they contain more moisture and less starch. Yukon Gold potatoes are an example of a particularly sturdy boiling potato that will hold up well and keep its shape. 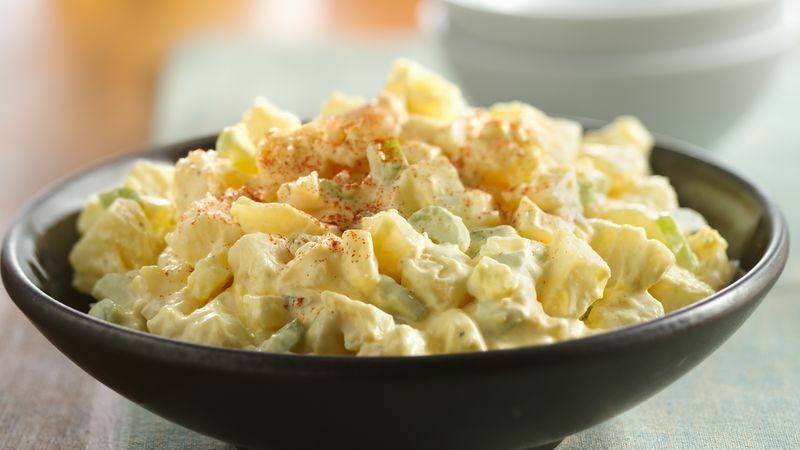 The potato salad ingredients you’ll want to include depend on your own particular preference, but celery, onion, egg and mayonnaise are the classic choices. Once you master this easy recipe, try another from our collection of potato salad recipes.